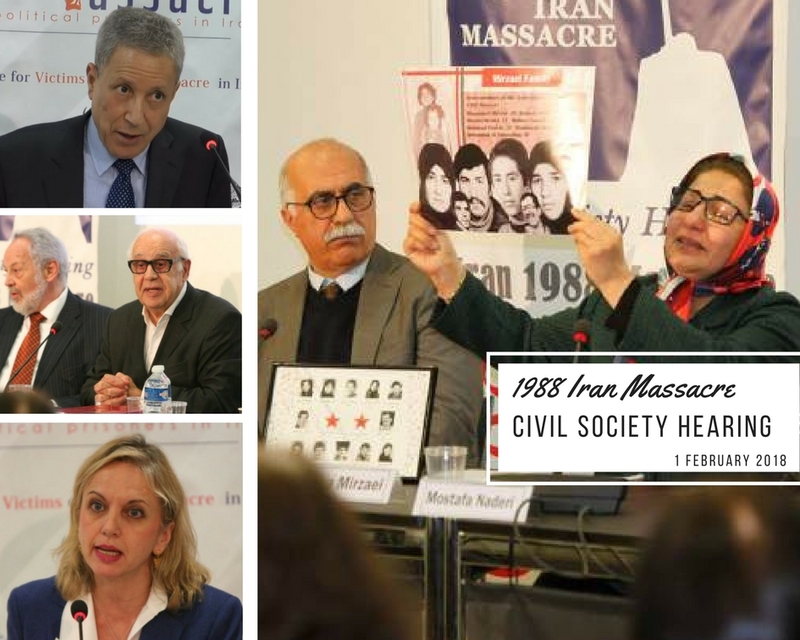 On 1st February 2018, at Club Suisse de la Presse, a civil society hearing on the 1988 Iran Massacre was held. The organizers were: Justice for Victims of 1988 Massacre in Iran (JVMI), Foundation Danielle-Mitterrand – France Libertés, Partito Radicale (Italy), Women’s Health & Research Institute of Australia (WHRIA), and the International Educational Development. The speakers included: Ms. Kirsty Brimelow, QC, Professor Jean Ziegler, Dr. Juan Garcés, Mr. Tahar Boumedra, and Mr. Eric Sottas. Ms. Kirsty Brimelow, QC, who laid out the historical context of the massacre, stressed how this event was a “crime against humanity”. These kinds of crimes have been happening throughout history: The Holocaust during WWII, the 1973 Chilean military coup persecution, the Rwanda genocide, and more recently, the Rohingya crisis in Myanmar. There were many testimonies of survivors and families who lost loved ones during the massacre. One notable witness was Razieh Parandak. She recounted her son’s story of arrest, imprisonment, torture, and execution. She spoke of his shared two-meter cell with seventy other prisoners and one window for fresh air. After her son’s death, the instructions given to the family members were simple: do not hang or frame the victim’s pictures, do not have relatives come and visit, and do not speak out against the executions. To forbid families from hanging the pictures of loved ones is significant because the burial ritual for those who died young was to have their photo on the door of their homes. In his closing remarks, the moderator, Mr. Tahar Boumedra, adviser to the Secretary General’s Special Representative for Iraq, challenged civil societies to make independent statements and to come together collectively to report to the UN General Assembly of the alleged massacre and give a voice to the victims and their families. It is the duty of all of us, especially civil society, to do our part to be aware of human rights violations, to ensure reparations for the victims, and to work on reconciliation. No one can rewrite history, but together, we have the opportunity to make a difference today and build a better tomorrow.